Broken glass at a restaurant still under construction. 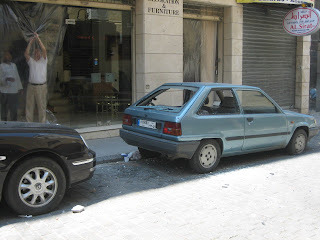 A car and shop behind are left with no glass. This morning I woke up feeling optimistic: It was a beautiful sunny day, there hadn’t been any notable gunfire/rpgs for quite a while, and I saw people creeping out onto the streets. My boss called and asked me to go into work, so off I set. Only a street away, I began to get a feel for what had happened Thursday/Friday. 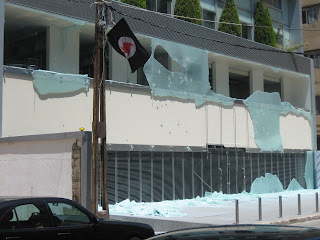 The whole of Hamra was full of black flags, with a Nazi-like red symbol enclosed in white. : the flag of the Syrian Social Nationalist Party, who apparently took the area over on behalf of Hizbullah. It is still to early to tell truth from reality however. Many shops near my house were wrecked, one was burnt out, most others had shattered glass, which their foreign workers were duly cleaning up. 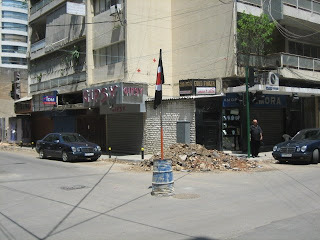 And yet Hamra street was almost back to normal, with people aplenty. There was, however, one exception: people were not buying clothes or meeting friends for coffee, but were going on exploratory missions: what had been hit, what food shops are open, what would provide a good photograph, etc. 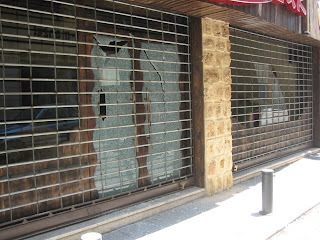 I myself picked up a bullet cartridge from the middle of the street and took it home: I did the same in August 2006 when I visited Haret Hreik in South Beirut, whose buildings took the brunt of Israeli air strikes. That time I had taken a piece of a jigsaw puzzle, a tiny remnant of some family’s life whose property had been strewn across the pavement when their apartment was ripped apart by a missile attack. It is possible that some people think what I did was wrong, but I carry that piece of puzzle around with me everywhere I go, as a reminder of how quickly you can lose everything dear to you and how quickly you can lose your life. I shall hold onto my copper-coated bullet case for the same reason, so as to always remember the absolute idiocy of violence and to never be tempted by anger into such violence. On my way to work I have to pass several government buildings and two Future/Mustaqbal (of the Hariri family) TV buildings. I was surprised to see that there were not all that many soldiers guarding those building, as I had seen on the TV the previous evening alot more. Where had they all gone? After work I stopped by my local manooshi bakery for a little bite to eat. Manooshi’s are my absolute favorite: soft pizza-like bread straight out the oven, cooked with dried thyme and sesame and garnished with tomato slices, olives, cucumber and mint. I was happy to see Yehya, the amiable young chap I always buy my manooshi from, smile out at me and hand over my order without me even asking for it: he knows my tastes too well. I’m glad he and his heavenly bakery made it through the fighting unscathed. Having stuffed myself, my mother and I went back out for a little walk, having felt stifled by staying indoors. We wandered down to my mothers friends house, which is directly next to the Future TV station that got torched yesterday by the Syrian Social Nationalist Party. Her house stank of post-fire- my own apartment recently caught fire and so I knew the acrid smell all too well. The family had spent most of the night in the bathroom, after stray bullets hit their apartment repeatedly. I mentioned in an earlier post her husband was actually struck by a bullet-by some stroke of luck it only hit the side of his leg and so he only had a small cut. They have several bullet holes through their windows and showers, and the Syrian party across the road are keeping a watchful eye on the street: as I took a photo of the burnt out Future office, I noticed an armed gunman monitoring my activities. I pretended I hadn’t seen him and kept taking photos. Walking home, my mother noticed something eerie: I was talking on the phone to a friend in Syria so wasn’t paying attention. All the pedestrians had disappeared from the streets and all the shops had closed. The roads were deadly quiet. I ended my call, we quickened our pace and got back home as soon as we could, anticipating a turn for the worse.